Date: Wednesday, 24th November 1965. Venue: Bruno Plache Stadion, Leipzig, Germany. Competition: Inter-Cities Fairs Cup, Second Round, First Leg. Score: SC Leipzig 1 Leeds United 2. Scorers: SC Leipzig: Frenzel. 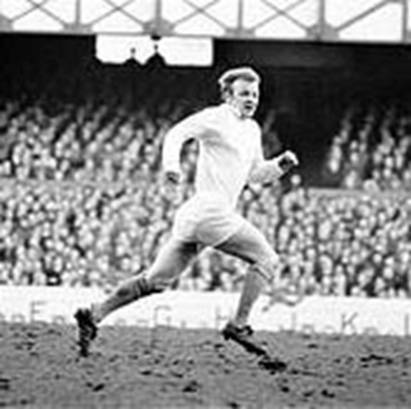 Leeds United: Lorimer, Bremner. SC Leipzig: Weigang; Faber, Geissner; Pfeufer, Naumann,Geisler; Engelhardt, Trolitzsch, Frenzel, Zerbe, Loewe. 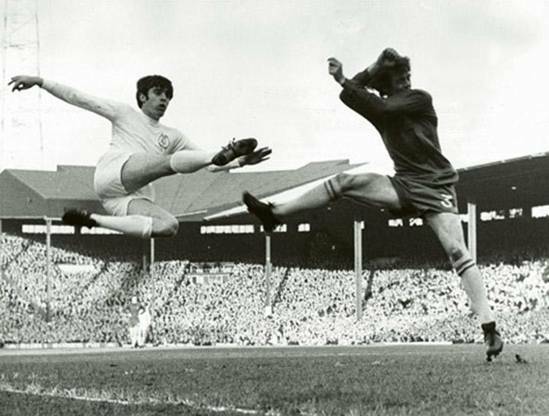 Leeds United: Sprake; Reaney, Bell; Bremner, Charlton, Hunter; Storrie, Lorimer, Madeley, Giles, O’Grady. United’s third game in their European journey took them behind the Iron Curtain for the first time to meet East German team SC Leipzig. 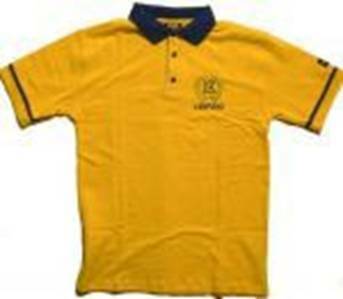 In 1963 Leipzig's two most important clubs, SC Rotation and SC Lokomotive Leipzig, were put together resulting in two new sides being founded. SC Leipzig and BSG Chemie Leipzig. 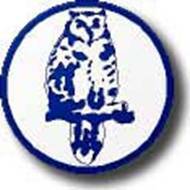 East German football went through a general re-organization in 1965 under which SC Leipzig was transformed into 1.FC Lokomotive Leipzig, while rivals Chemie Leipzig continued as a Betriebssportgemeinschaft (BSG), or a company team. Playing as Lokomotive, the club's fortunes improved somewhat as they almost always finished well up the league table, but they were unable to capture the DDR's top honour with losing final appearances in 1967. Such games were major expeditions, unlike the present day jaunts on modern day transport which literally take only hours. To play Leipzig United were able to fly into West Berlin and take a bus to ‘Checkpoint Charlie’ but that was where any luxury ended. On the eastern side of ‘Checkpoint Charlie’ an East German bus awaited, complete with rusty wheels and no home comforts. It took off for Leipzig along pot-holed roads for two and a half hours in the snow past buildings that were austere in the extreme, an unnerving experience for the young expeditionaries, who were well aware of communist regime and its effect on the people. Revie was taking no chances on the eastern bloc hospitality and took along all United’s needs, taking their own food and a chef. As there had been six inches of snow overnight, all Leipzig did was to pack the snow and paint the pitch markings in blue and an orange ball was used. Peter Lorimer is on record as saying to give United traction and advantage the staff had shaved off the lower layer of the studs leaving the nails exposed, but to pass the referees initial inspection had replaced the missing layer with cardboard. It was a simple task to dislodge the cardboard as soon as they got the game underway. The result was better traction and some bloodied opponents who bore the brunt of the barbed tackles. Revie also developed a game plan in away games, instructing his team to silence the home crowd by dominating the game early on. His belief was that if you frustrated the opposition, the home support might turn against their own team and undermine their team’s confidence. Once more United played the ‘Numbers game’ with Bell as (9), Charlton as (3), Madeley as (4) Bremner as (5) in an effort to foil man-marking by their opponents. With the loss of Captain Bobby Collins, Jack Charlton took over as Captain and Paul Madeley was pushed up into midfield as his replacement with Willie Bell coming in at Left-Back. United were also missing striker Alan Peacock with a hamstring injury and Scotsman Jim Storrie was drafted in as his replacement while new boy Mike O’Grady was preferred to Terry Cooper on the left wing. Storrie was employed on the right wing and it soon became apparent that Billy Bremner was pushing up into the centre-forward spot with Paul Madeley at right-half. Neither side could get on top in the atrocious Arctic conditions and the game seemed to be drifting into a scoreless draw until with ten minutes to go Mike O’Grady had some fine inter-play with Willie Bell before he crossed for Peter Lorimer to rifle home from fifteen yards, after eighty minutes. Straight from the restart United gained possession and a miss-kick from full-back Klaus Pfeufer looped into the air and straight to Peter Lorimer whose header found Billy Bremner, whose back-header, reminiscent of his goal in the Nottingham replay of the FA Cup semi-final of the previous season, beat Michael Faber on the Leipzig goal-line to give United a two goal advantage, after eighty-two minutes. Almost immediately play swung to the other end and Henning Frenzel got free of Jack Charlton for the only time in the match to score, in the eighty-third minute, but In the end United triumphed 2-1, in front of a sparse crowd of just eight thousand frost-bitten souls hardy enough to brave the elements.